The cutting table is once again usable. That was a huge job, which took me parts of 3 days. When I cut all the squares earlier, I saved anything that would be a strip. I trimmed them so they have straight sides and are ready to use. Then I put them by colors into two boxes. This one has all the full width pieces and the other box has all the other strips. 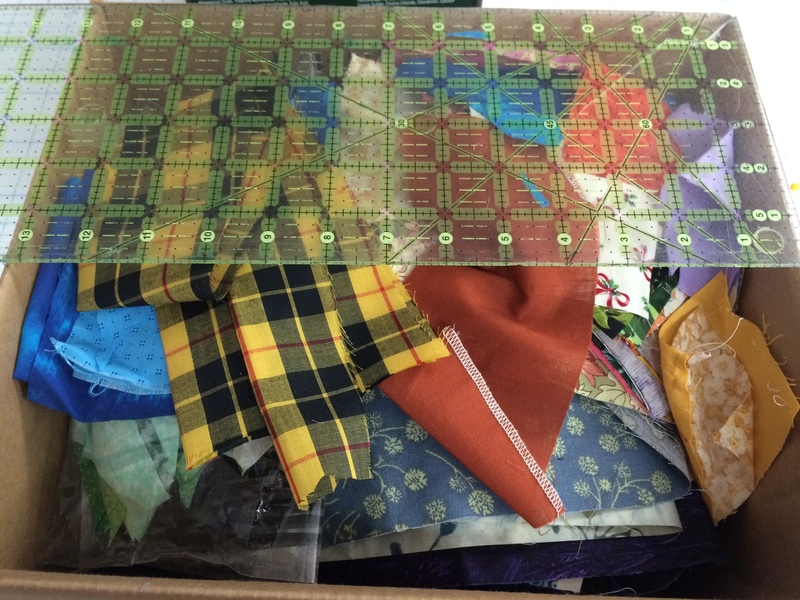 This 13″ box holds the pieces that are a bit larger and I might want to use for applique or ?? I thought for sure we were going to see Grace’s baby today, so I confined her. 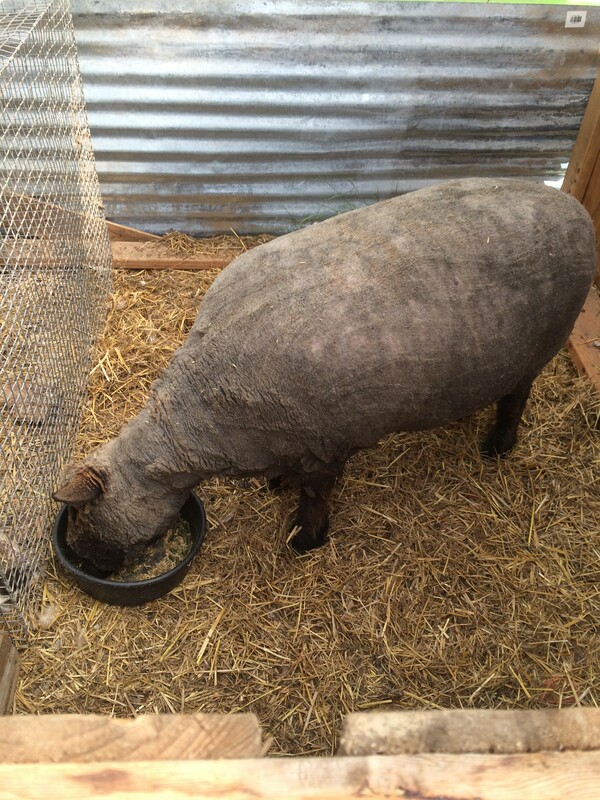 As soon as the grain was gone she was having none of that, so she spent the day with her friends. Maybe it will be a May Day gift. 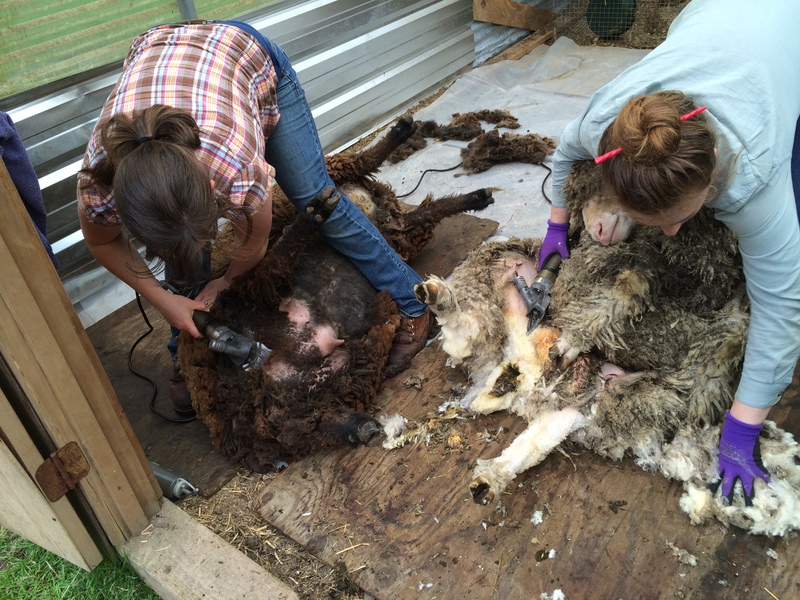 Shearing day arrived!. Fortunately these sisters work together to make the job faster. 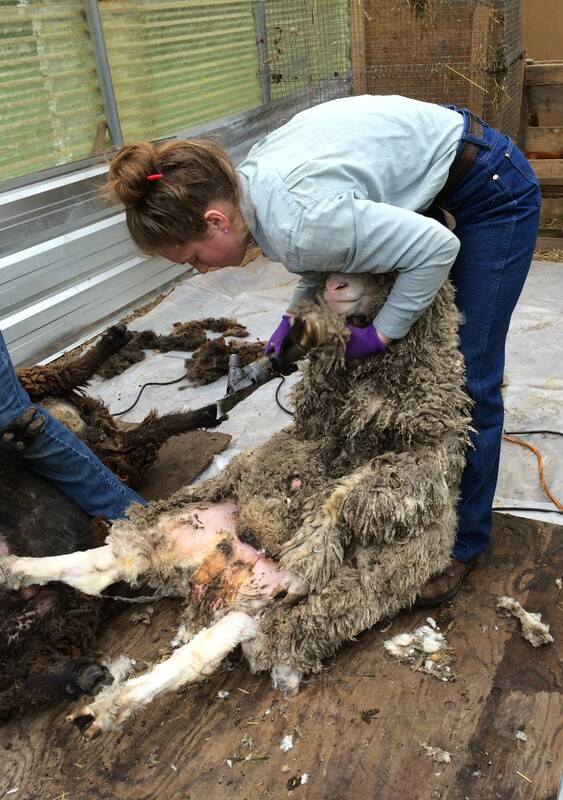 The sheep being sheared are relatively immobile when set up on their back-end like this. But little Ava did not like that they took her favorite adult and were working on him. 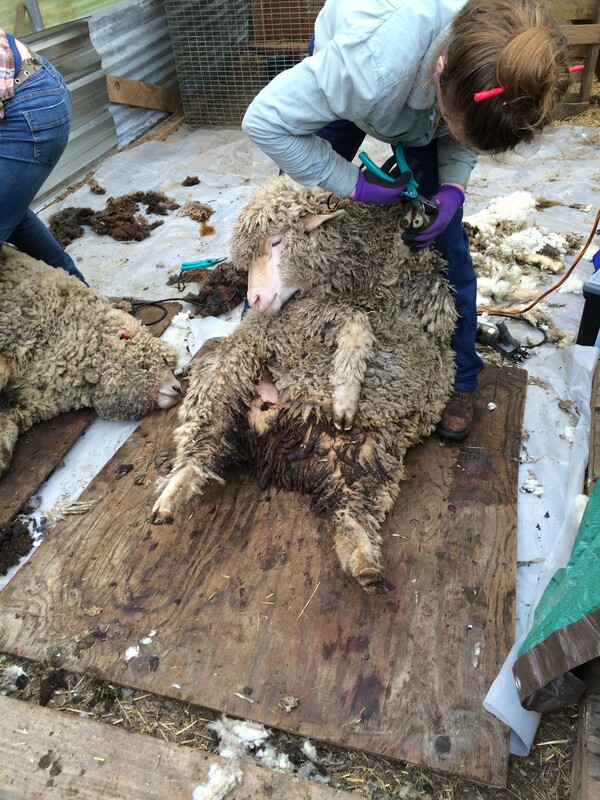 5 sheep, 5 big piles of wool. At this point, I just piled them on the wheel barrow to bring them up to the house and get them washed, which will happen when the sun comes out again. 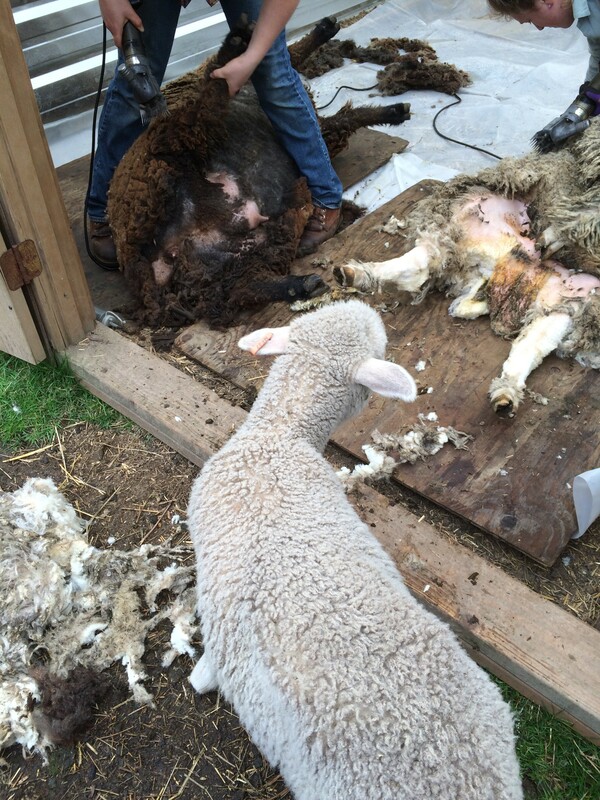 And the sheep are bare. 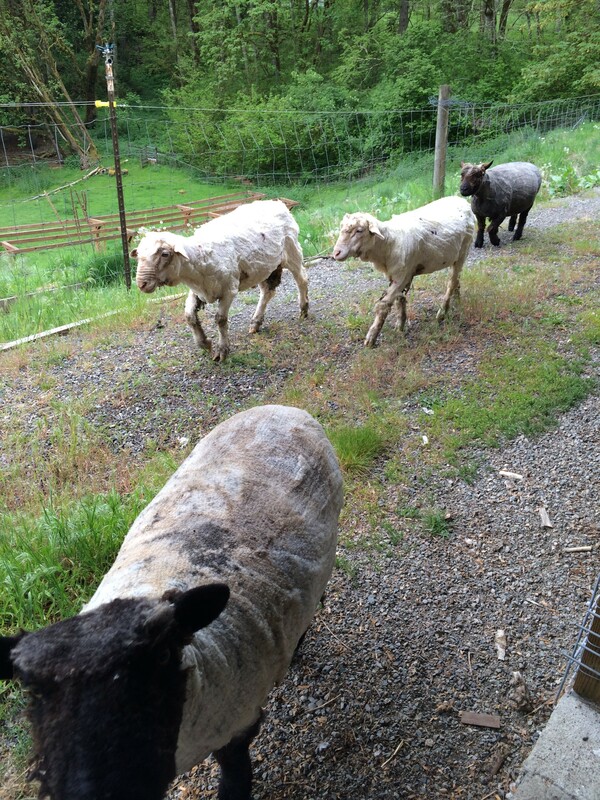 With all that wool off, it is clear that we should be getting a couple of lambs in the very near future. 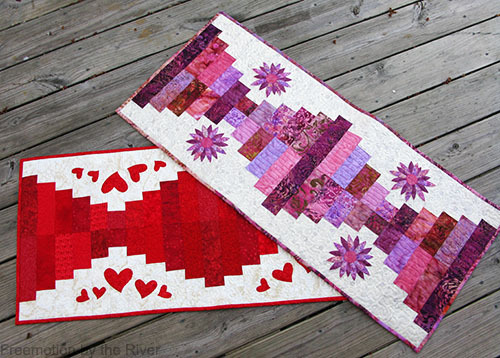 Hurry, this pattern is free at Craftsy, but only until the end of April (Thur). There are so many ways you can use the basic design. Piano Keys by Connie Kresin is simply 2.5″ pieces cut to different lengths and sewn together. In fact, if you purchase a jelly roll, there is very little cutting. There are many free patterns at Craftsy. If you haven’t been there yet, you are missing out. I decided to go through a few of my scraps and I made this blue runner. It was easy and fun. I haven’t decided on an applique yet. It would be fun to have these themed for different holidays. Maybe I should be doing one for July 4rh. I know I’d like one for Valentines day. 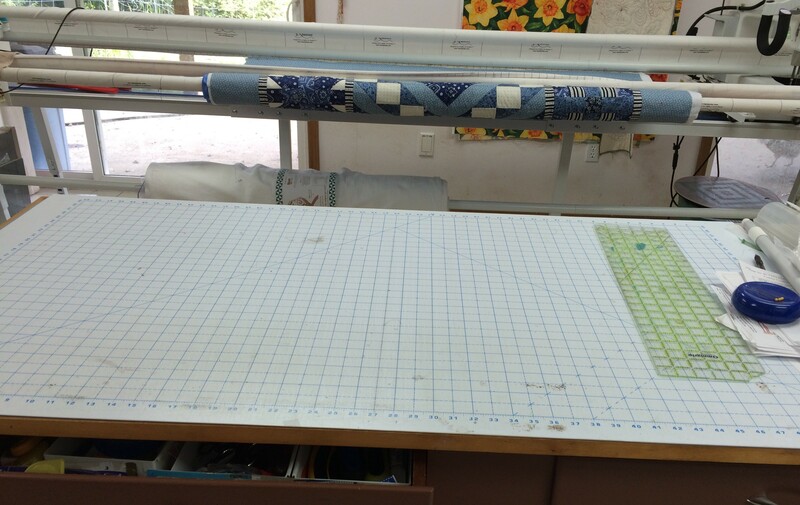 It’s time to look through a few more of those scraps that moved from the cutting table to the longarm machine. 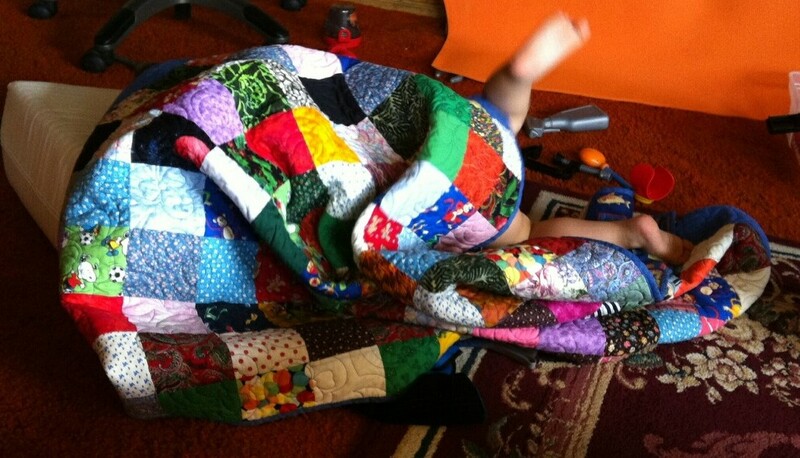 Oh, yes, and then I could quilt the quilt on the machine. The sneezing has been going on since Thursday, but when it interferes with life, it’s time to take action . After seeing that another blogger was happy with this program, we watched the movie Fat, Sick and Nearly Dead with Joe Cross and decided that might be a way to end this cold a bit sooner. Although if one does have to get all those veggies and fruits, and clean them, then prepare then, it may set one back another day. Some of his recipes are pretty good and others I can live without. It’s a good thing we have a choice. The good news is if you don’t like something, the next time you make it, use a different fruit or vegetable. Today was our first day and though we are full since we drank a lot during the day, I am very much wanting to chew – you know, like a handful of nuts. Our goal is 5 days and day one is DONE. Several things are now finished. It seems for so long, one isn’t accomplishing anything, and then all at once several things cross the finish line. 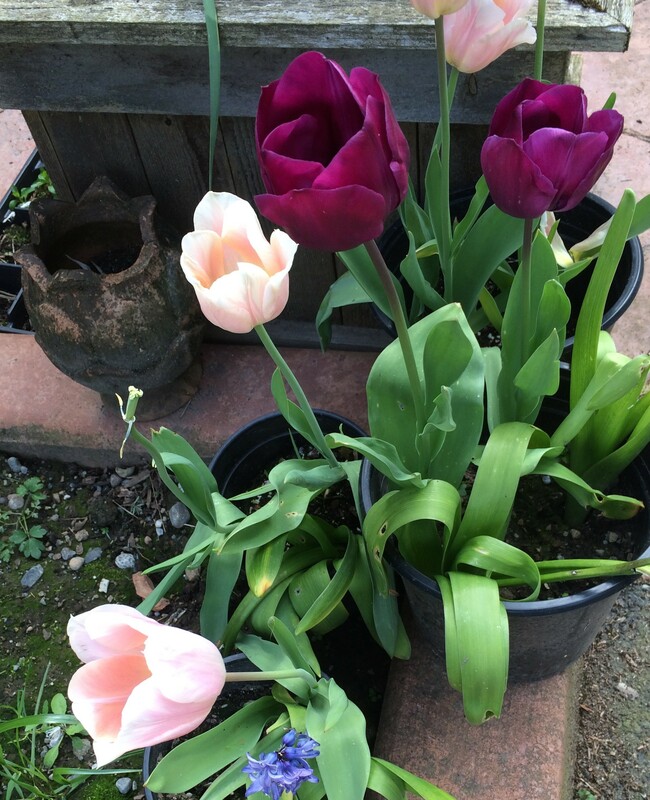 Though still beautiful these are the last of the tulips and are nearly ended. Another finish is that the fellow who occasionally is able to help me, had about 4 hours today, so he was able to finish up the garden box in the hoop house. Now this week, I will get the dirt smoothed out and get the fertilizers on ready for the tomato plants. He also put up a different fencing on the driveway side here. We put a low fence up originally because we didn’t want it to look bad. That didn’t work as the dogs walked right over it. So now a field fence and maybe if I can keep the chickens away long enough, some sweet peas and other plants to grow up on it. I like the chickens and they do a lot of bug work, but they are really hard on plant starts. 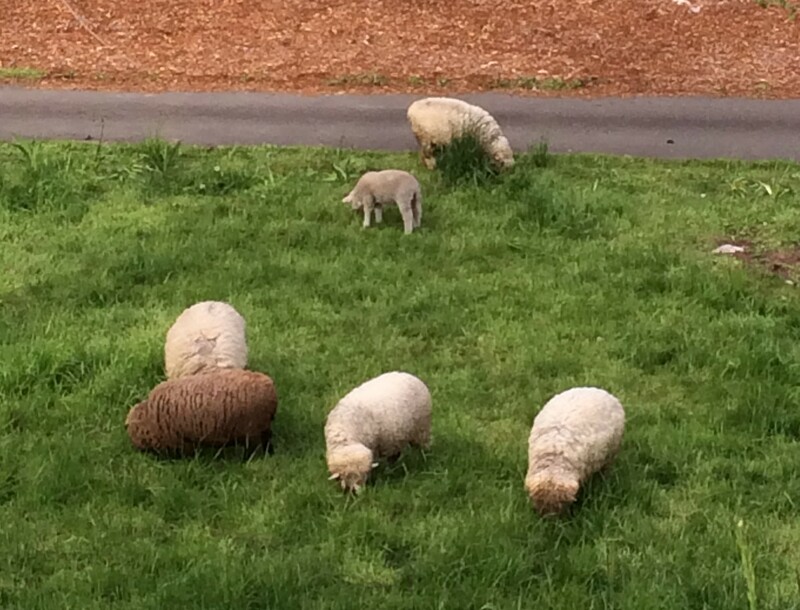 The lawn mowers are working out well. So far, the mowing tractor has not come out of the garage this season. That gives me a two for one. No mowing and no hay buying as long as the grasses are good. 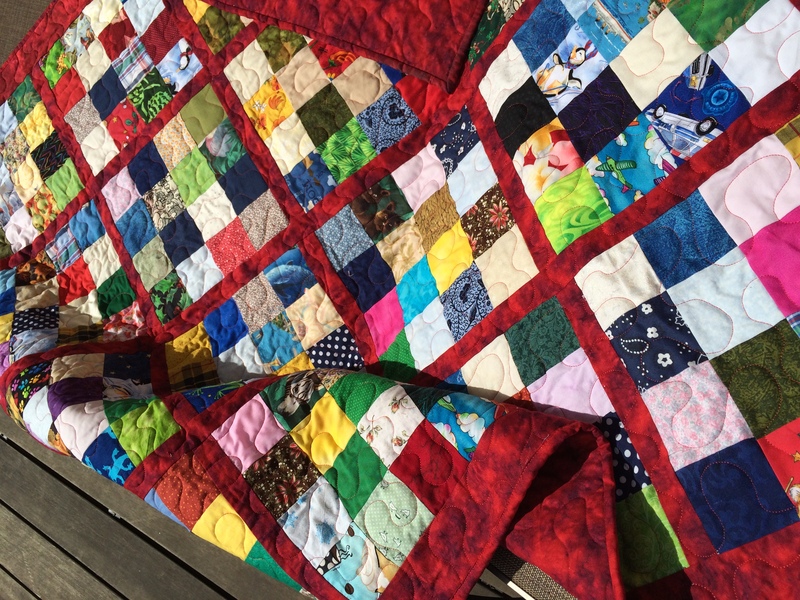 This quilt is finished at 48″ square. I gave the blue one like this to a little boy today who is just 18 months old. I wanted a photo, but he insisted on burying himself in it. See if you can find him. He appears to be enjoying it. 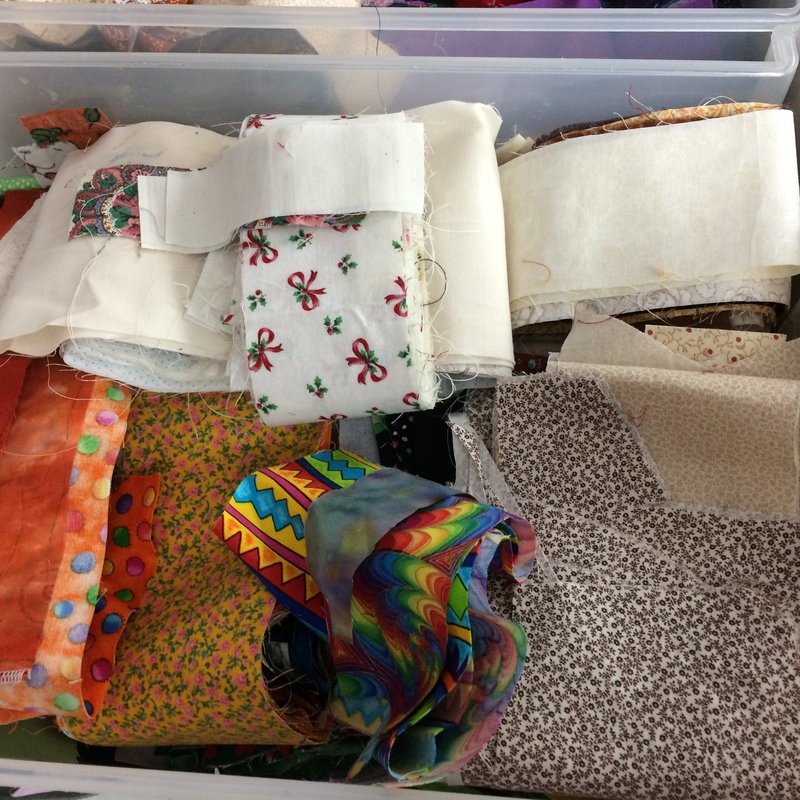 I’m looking at the weather forecast and thinking that there may not be much sewing in this week – more gardening. This is a nice enough dish cloth or should I call them sanity cloths. However, the instructions were not to my liking. It had one start with a cast on of 27. This is none to wide and I cast on of 36 stitches. There were a couple other places that took a bit of interpretation. 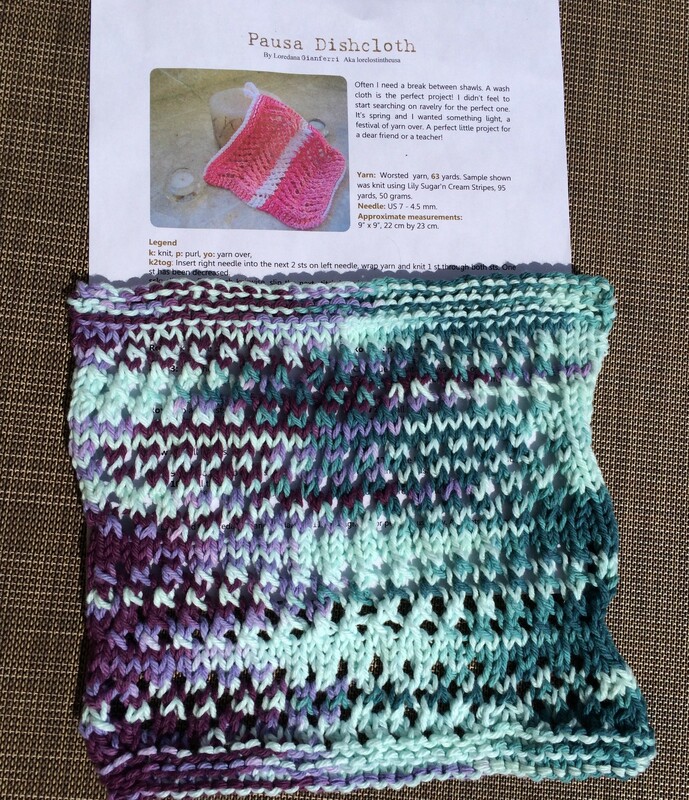 As you can see, the pattern that I ended up with does not look like the photo. I will not be using this particular pattern again. 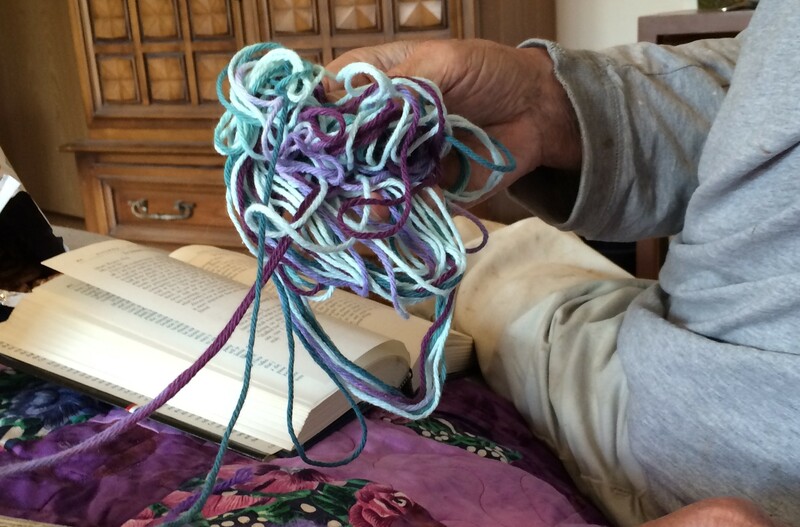 Near the end, the ball fell apart and since there wasn’t much yarn and it was big cotton yarn, I handed it to DH to learn to unscramble. Let’s just say, I ended up doing it. Thank you so much for all the emails with hugs and prayers. Daughter is now home, with no memory of how she fell. So it is time for us to resume life. 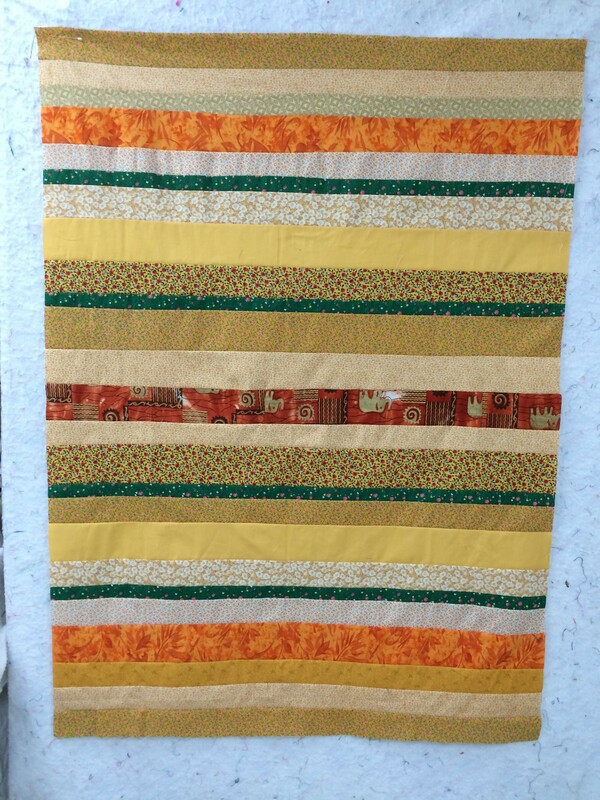 I needed something fairly simple to do this afternoon and these stripes were cut, so I assembled them and this top can now go into the pile to be quilted. I still have a table full of strips that need to be sorted and put away. These are easy and pretty enough, that I may make another one or two for people who need them before cleaning off the cutting table. This day started like most. Get up, dressed, etc. Mid morning was unscheduled since it was raining, so we decided it was a good time to renew my driver’s license, which I did. On the way home, I started feeling chilled. Upon entering the house, I grabbed the clean sheets out of the dryer, made the bed and crawled in where I slept and woke up with a fever. So far, even this is normal – I mean, there can be a day where we just aren’t up to par. And I’m a firm believer that if one just goes with it, the whole episode is over much faster. So I spent part of the day in bed. God knew I’d need this rest. At 5:30 this evening, I received a phone call from my daughter’s room mate which the police took over to tell us that our daughter had fallen and was being transported to the hospital. Off we went. These things take hours. The doctor came in and said the brain was bleeding and she had to be transported to a bigger hospital that deals in these situations. The next few hours are critical and we request your prayers. 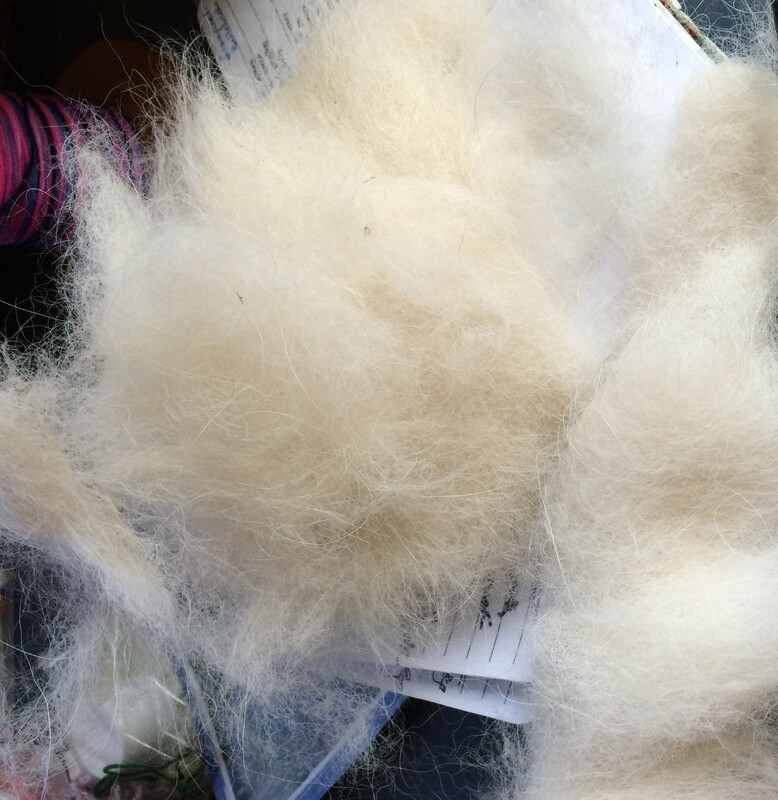 As I sat down and thought about writing this blog, I wondered how I could make white fiber and an incredible number of hours seem like fun. 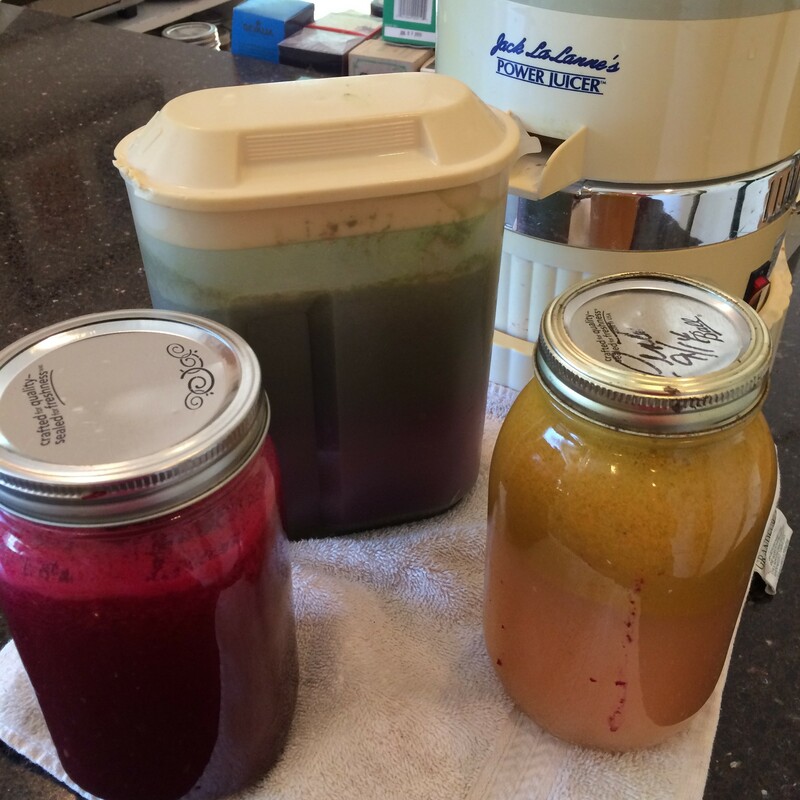 I decided that only one who enjoys the process of taking the fiber from raw to finished could understand. And it would probably be the same if I had a piece of wood with which I was planning to make a fancy planter, or paints to create a photo. I cannot create the fancy planter or paint the picture, so am happy to purchase from someone who can. As I brush the dogs, I save what is fairly clean to spin. 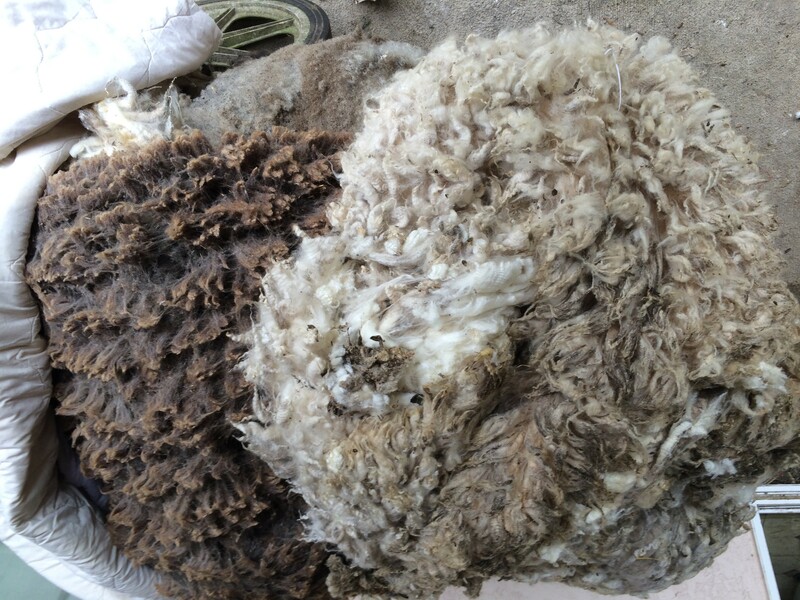 The above is a pile of Pyrenees dog wool, which has soft undercoat mixed with the hair. I will spin wool and alpaca to ply with it. It will give me hours and hours of enjoyment while I think of those before us who had to make clothes this way. After I spin and ply it, I will select a pattern (probably a hat) to knit. Then in years to come, I will have a memory of these special dogs. This a good look at hours and hours and hours and more hours of spinning. 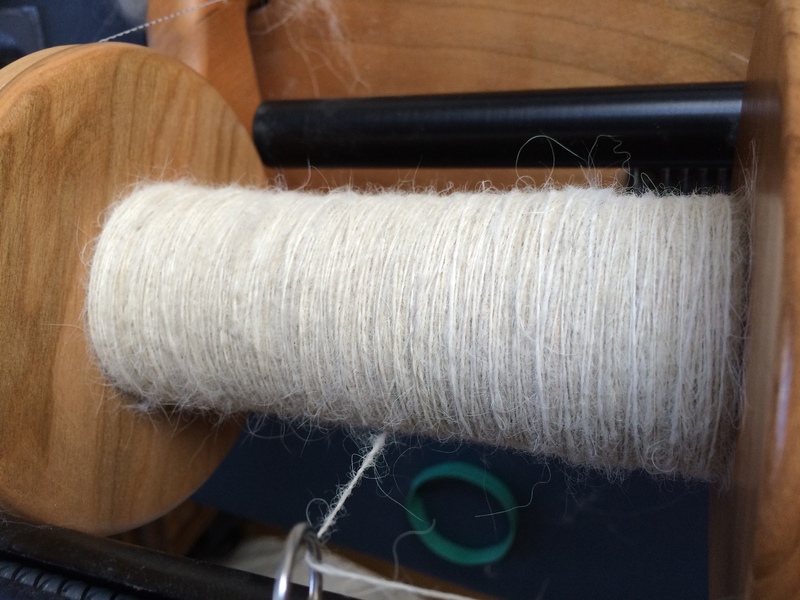 When spinning, a little fiber gives hours of enjoyment. I can’t think of another hobby that ones can get so much fun for the cost. 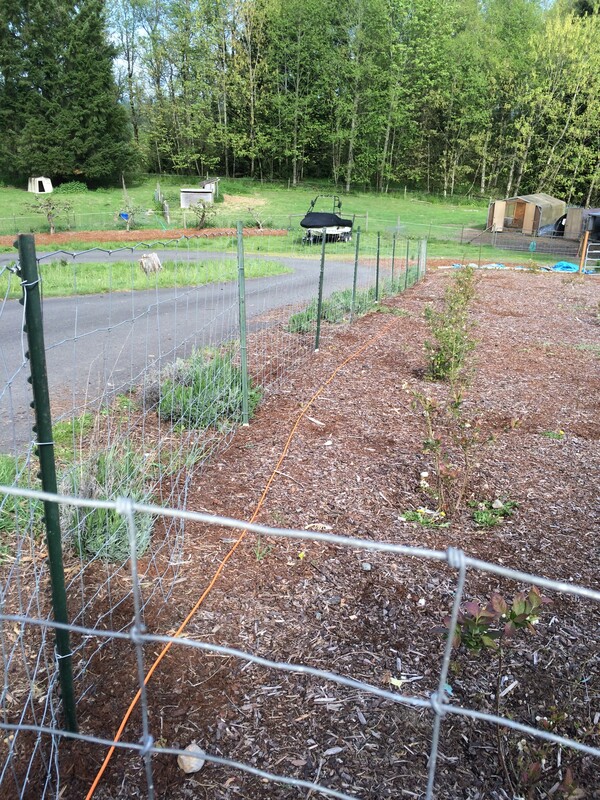 When the weather warmed up enough to go out and work, I did get another row and a half cleared of weeds and potatoes planted. As you can see in the darker areas, there are some volunteers from last year. 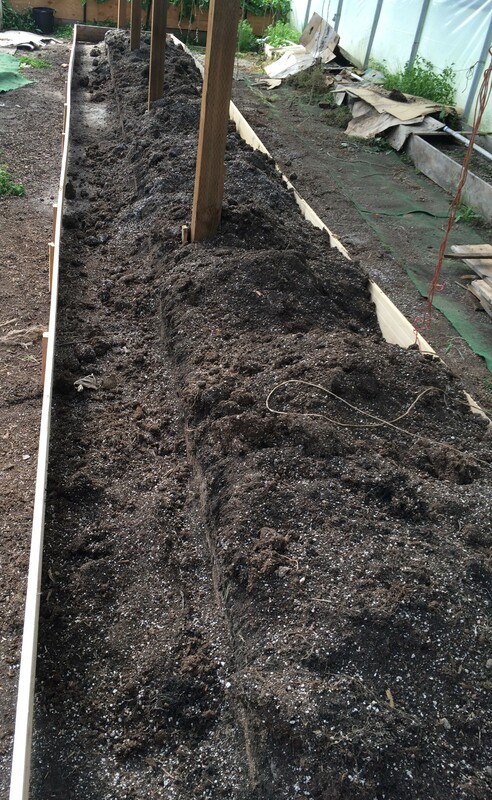 I think we will try putting black plastic on the hillsides between the rows as there is just too much hill and too steep to keep it under control. 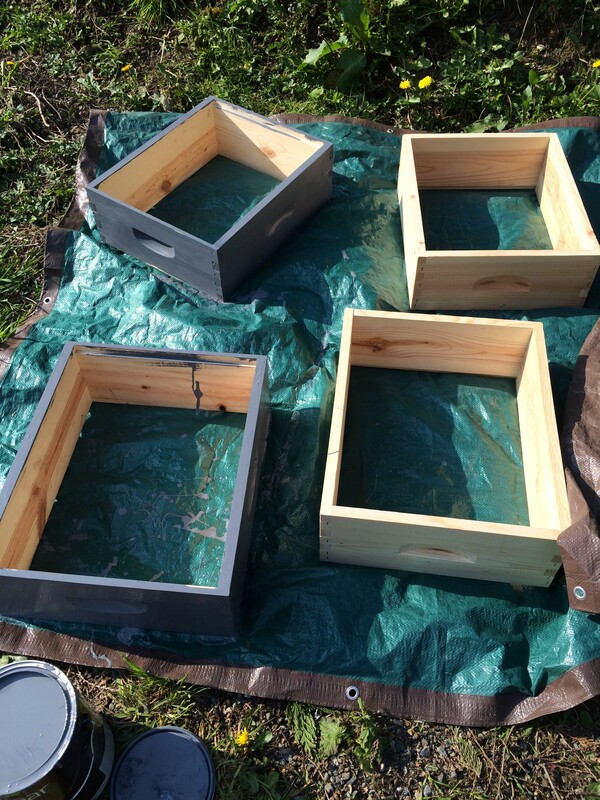 All 4 of these bee boxes are now painted. Tomorrow, I will check and see if we need to add another to either or both of the hives. 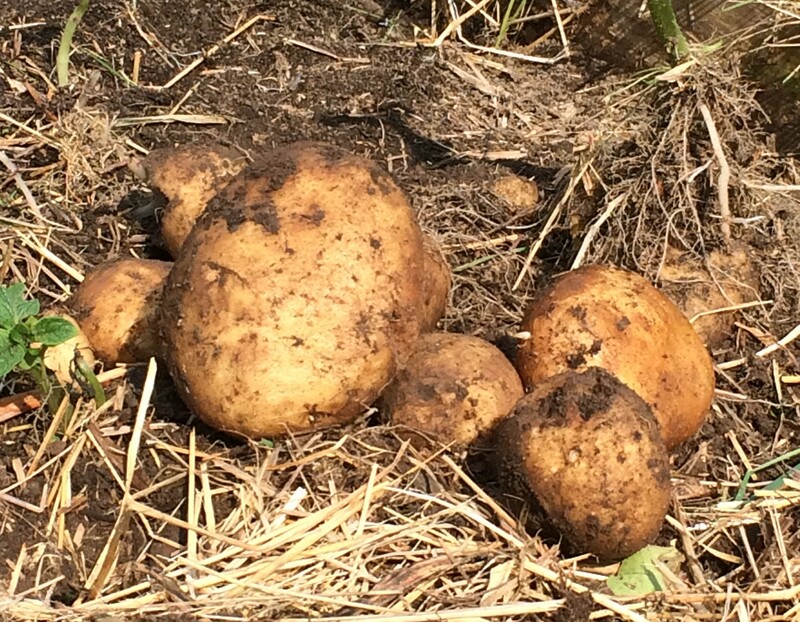 As I was weeding in preparation for planting, I found a few potatoes. I’m not sure if we missed them or if they were tiny last fall when we harvested and were left behind and have now grown. OH, yes, and I found this little fellow, who I promptly put in a safer place. 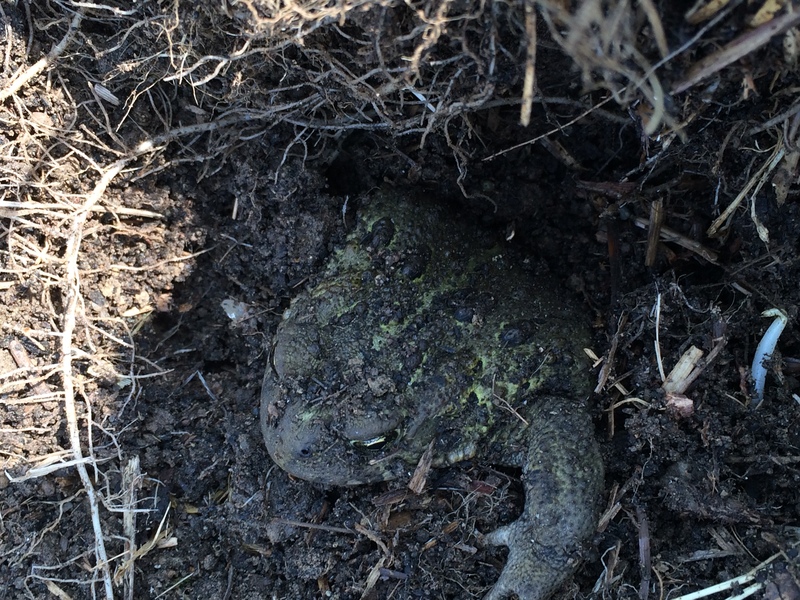 Our place is full of toads, which eat bugs. We also have the chickens, so with all these bug predators, what’s with all the bugs. 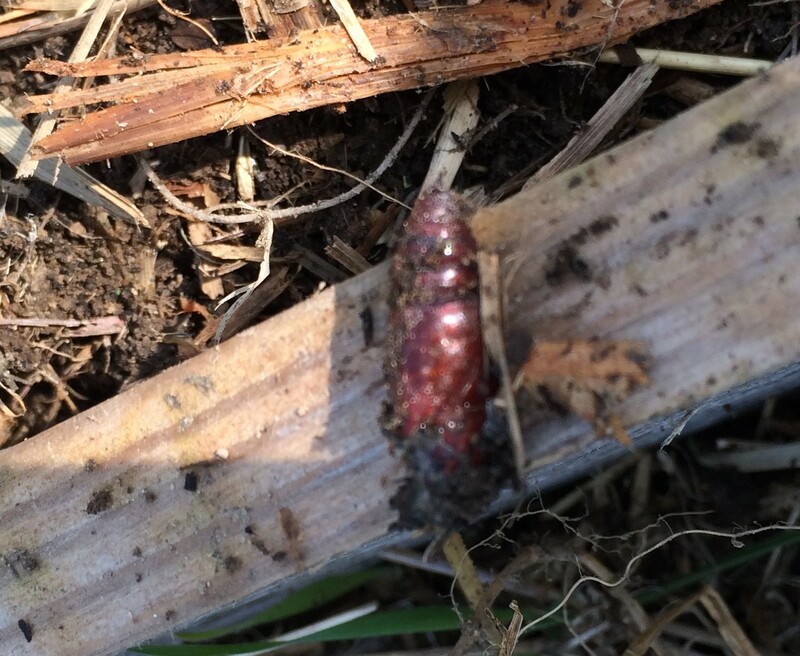 Do you know what kind of bug this is. We have a number of them both out here in the garden and in the hoop house. 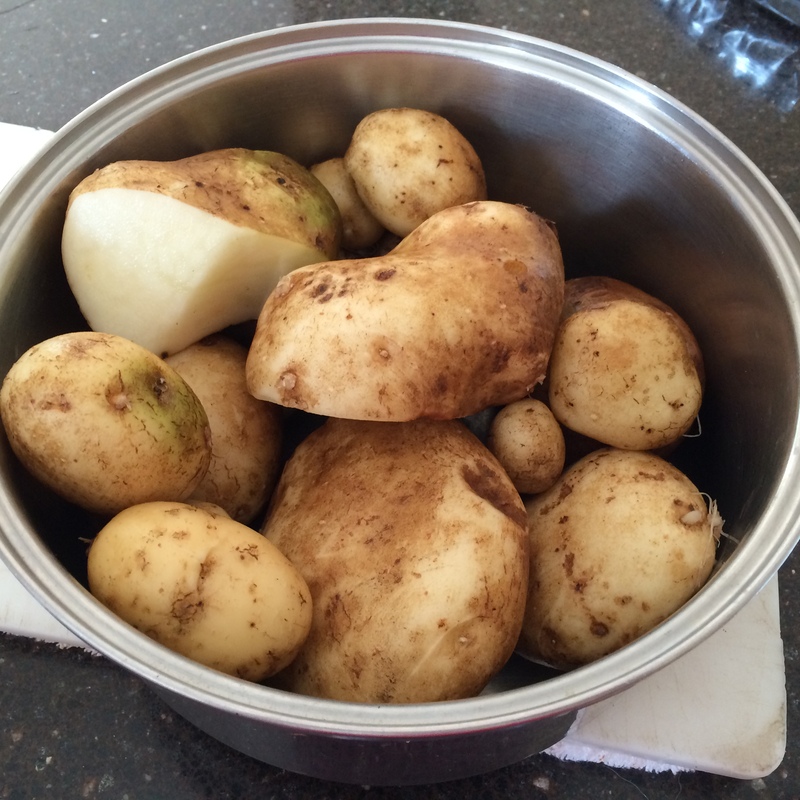 By the time, I finished weeding that 20′ row, I had a large kettle of potatoes. 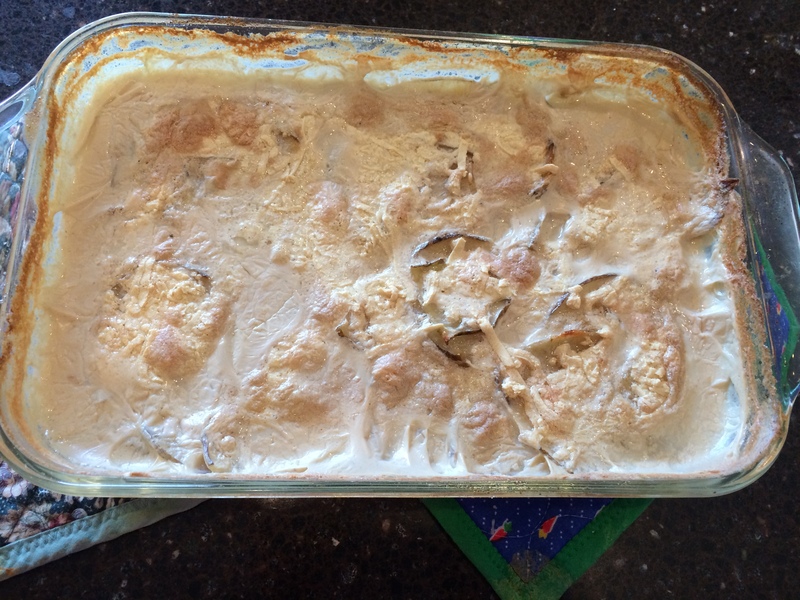 For lunch, we had one of our favorite dishes – scalloped potatoes, to which we added a salad with artichoke hearts, celery, carrots, capers, lettuce, and cauliflower.